Canstruction rules allowed SCE volunteers to use cellophane tape to secure cans on the back of their electric bucket truck. SCE volunteers used metal rods with nuts and bolts to tighten each layer of plywood for their Canstruction electric bucket truck. SCE volunteers hold their breath to see if the cans will hold as they build their Canstruction version of an electric bucket truck. SCE volunteers show off their version of an electric bucket truck after a practice build before the Canstruction event. SCE’s Transmission and Distribution unit spearheaded this year’s effort, which is the company’s first entry in the 10-year-old Orange County event. 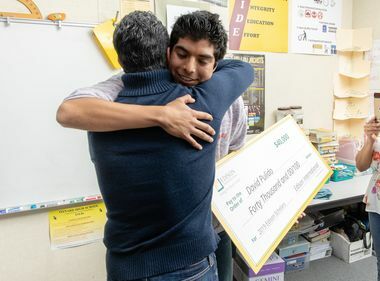 “I thought, ‘Wow, this seems like a cool thing to do,’” said Brian Chen, SCE principal manager of engineering. “We could do something for the community and be able to showcase the technical and creative skills of our engineers. Barriga, a transmission engineer who took the Transmission and Distribution design team lead, figured it couldn’t be that hard building something with cans. After all, when he was a student at Cal Poly Pomona, he built a concrete canoe that could float. “We are engineers here,” he said. “We design stuff and put it together all the time. 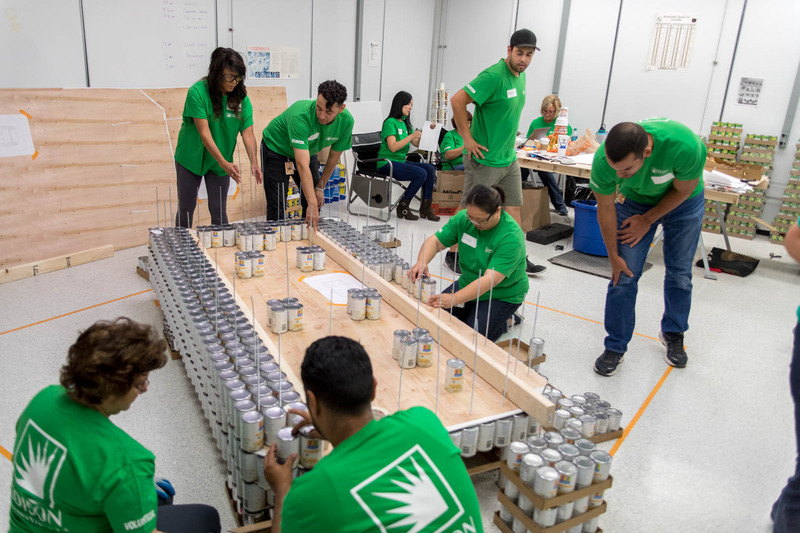 SCE volunteers line up cans between layers of plywood during a practice build before the Canstruction event. Four months and 80 hours into the Canstruction project, Barriga knows better. He estimates it has taken the core team in Transmission and Distribution and about 75 other SCE volunteers all their engineering and creative know-how to design and build a waist-high version of an SCE electric bucket truck with a charging station and wall mural, all made of cans. The SCE team’s efforts will be on full display at John Wayne Airport beginning Friday after the volunteers reconstruct the truck during a marathon overnight session that begins late Thursday night. The truck will be on display in the Terminal A baggage area until Sept. 24. As easy as the project seemed, it was the cans that posed the biggest challenge. 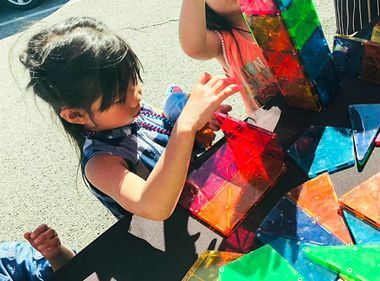 “We learned that not all cans are created equal,” said Kristine Bugarin, an SCE administrative assistant, who was the design team lead for volunteers. For instance, although they used a variety of one-pound cans of beans, they quickly learned some brand’s cans were taller and others had a wider diameter. That made them not only difficult to stack, but it was even harder to load the dimensions into the computer program to calculate how many they would need to build the project. “We’re used to standardized sizes of things like poles or hardware,” Barriga said. 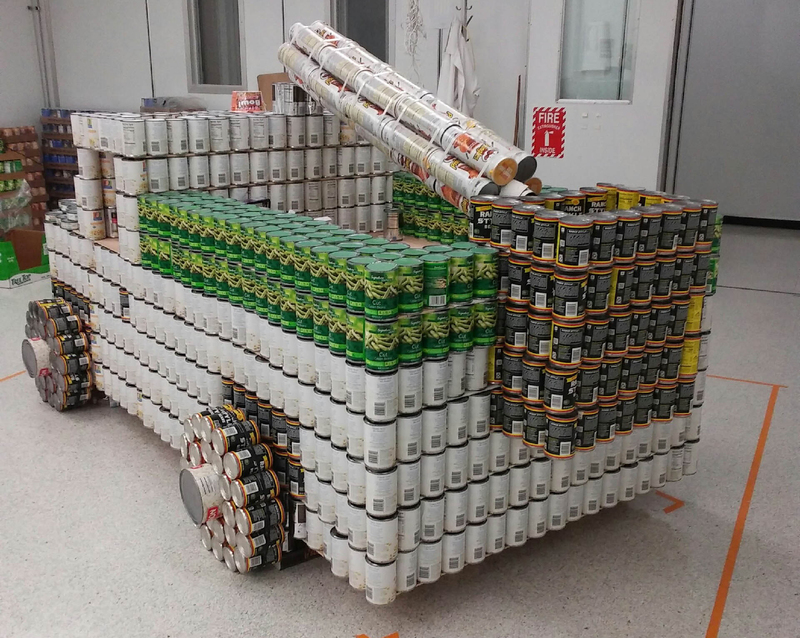 Black-labeled ranch-style bean cans make up the back of this SCE version of an electric bucket truck built for Canstruction. They ended up with a combination of 4,200 cans of green, ranch style and cannellini beans, peas, tuna, chicken broth and hominy. They had to get even more creative with some of the truck’s special elements. They used Pringles cylinders for the truck’s boom, ramen packages for the orange “hazard lights” on the cab and Mentos rolls for the charging station power cord. 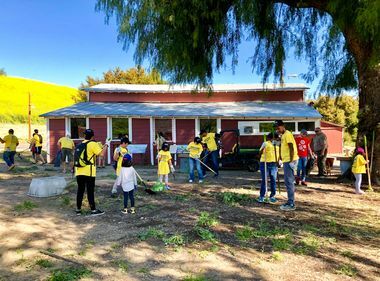 Although it took a lot more effort than expected, volunteer coordinator Bugarin said they were all motivated by the opportunity to create something using SCE’s engineering skill that would benefit such a good cause. All the food will be donated to the Orange County Food Bank. 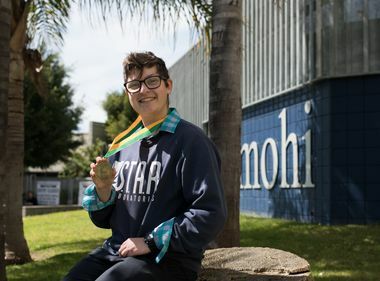 “We all live and work in the communities we serve and we like being able to give back,” she said.